Our mechanics are certified by the National Institute for Automotive Service Excellence (ASE). The video below explains more about ASE Certification. 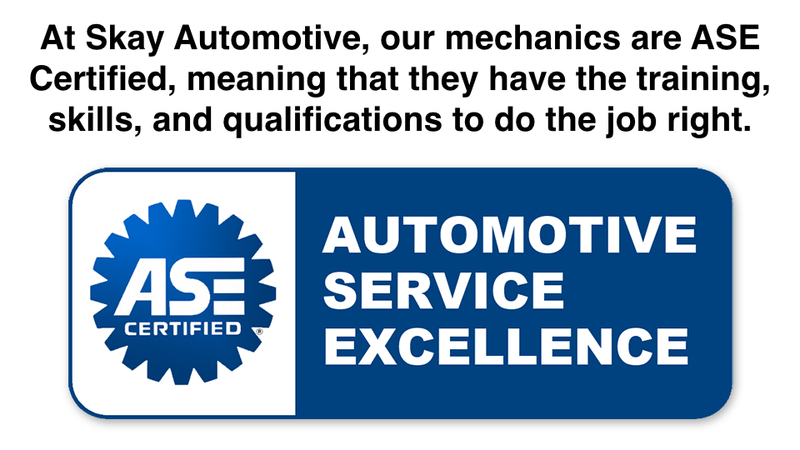 ASE promotes excellence in automotive repair and service. over 300,000 Automotive Technician and Service Professionals hold ASE Certifications. ASE Certified Technicians work in every part of the automotive service industry. We certify the automotive technician and service professionals not the auto shops. To protect the automotive service consumer, shop owner, and the automotive technician. We test and certify automotive professionals so that shop owners and service customers can better gauge a technicians level of expertise before contracting the technician’s services. We certify the automotive technician professional so they can offer tangible proof of their technical knowledge. ASE Certification testing means peace of mind for auto service managers, customers. How Does ASE Certification Work? In addition to passing an ASE Certification test, automotive technicians must have two years of on the job training or one year of on the job training and a two-year degree in automotive repair to qualify for certification. The exams are not easy. Only two out of every three test-takers pass on their first attempt. To remain ASE certified professionals must be retest every five years to keep up with ever advancing automotive technology. Who Writes The ASE Certification Tests? ASE Certification tests are written in workshops by a national panel of seasoned automotive industry professionals and executives, including working technicians, automobile manufacturers, aftermarket manufacturers, and educators. Not by any single person at ASE. Exams are segmented by sub-specialty such as automobile, medium/heavy truck, truck equipment, school bus, collision repair, and more. There are 40-plus exams each designed to discern the automotive service technician’s knowledge of job-related skills.